Flare For Ivory, under jockey Tanner Thedford, setting a new Arapahoe Park track record in the Dash For Speed Stakes Sunday afternoon. AURORA, CO�MAY 28, 2017�Flare For Ivory set a new track record when he defeated Live To Love Candy by a neck in the $14,550 Dash For Speed Stakes (not black type) at Arapahoe Park on Sunday. Stormy Red Morning was a head back in the blanket finish to finish third. Ridden by jockey Tanner Thedford, Flare For Ivory completed the 300 yards in :15.432 seconds, a 104 speed index, a new course record for Arapahoe Park. The previous record of :15.650 seconds was established August 31, 1996, 21-years-ago by Flew Bye A Winner. Trainer Jose Barron saddled the IVORY JAMES 4-year-old for owner's Hugo Barron Sierra and Marguerita Melendez. It was the fifth win 16 starts for the brown colt and the $8,730 winners' purse brings his earnings mark to $75,414. Vaughn and Jill Cook bred Flare For Ivory in Oklahoma from the Special Effort mare Special Phoebe. Live To Love Candy, an Oklahoma-bred son of second crop sire Cartels Candy Man, races for owner Santos Lopez and is trained by Miguel Pena. Fernando Camacho rode the bay gelding out of Found A Candy Tree by Oak Tree Special. Carl C. Pevehouse is the breeder. He picked up $2.910 for second. Trainer Tim Weeder saddled third-place finisher Stormy Red Morning for owner/breeder Robert Rodgers. 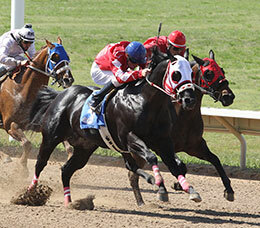 Alfredo Triana, Jr. rode the 5-year-old Red Storm Cat gelding from the Sweet First Down mare Sweet First Jean. He earned $1,455. Bachichanator, Shiner Blond, Unforgiven B, Stel Surprise and Essohess completed the field.